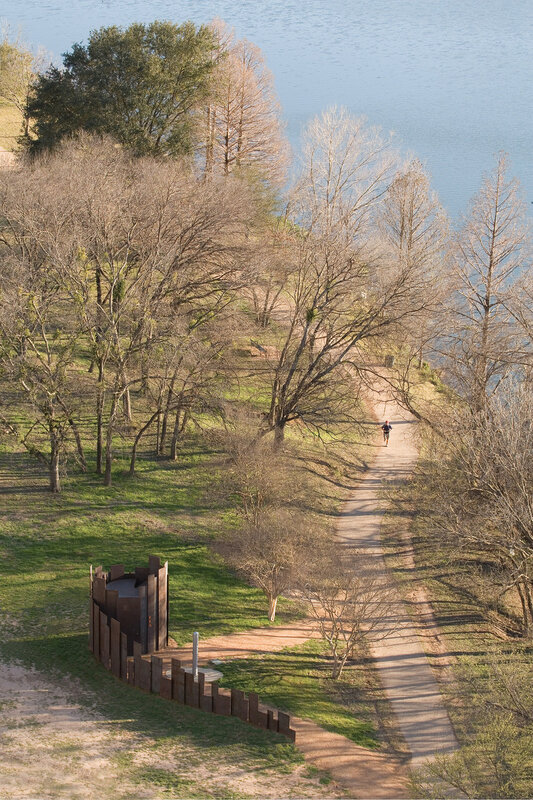 The Lady Bird Lake Hike and Bike Trail is a linear park of scenic trails and landscaping that follows the banks of the Colorado River in downtown Austin. Very popular among runners and bike riders, the park provides residents and visitors with a rural escape in an urban setting. The Restroom—the first public restroom built in the park in over 30 years—was built by The Trail Foundation, a community-based non-profit organization, in partnership with the city's Parks and Recreation Department. The Trail Restroom was conceived as a sculpture in a park, a dynamic object along the active trails. The structure consists of forty-nine 3/4" thick vertical Corten steel plates whose width and height vary significantly in size, from 1'-0" wide by 1'-6" high to 2'-0" wide by 13'-0" high. The panels are arranged along a spine that coils at one end to form the restroom walls. The plates are staggered in plan to control views and to allow for the penetration of light and fresh air. Both the door and roof were fabricated from 3/4" thick steel plates as well. The restroom is accessible and includes a drinking fountain and shower outside in addition to a commode, urinal, sink and bench inside. The simple building requires minimal maintenance: the plumbing fixtures are made from heavy-duty stainless steel, there is no need for artificial light or mechanical ventilation inside, and the Corten steel panels will weather naturally over time.